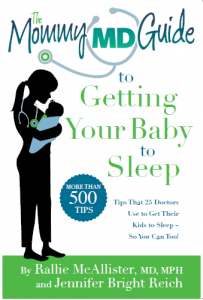 More than 500 tips that 35 doctors who are also mothers use to get their own kids to sleep! The Mommy MD Guide to Getting Your Baby to Sleep is filled with more than 400 tips that 38 doctors who are also mothers use to help their families sleep better. Combined, these doctors have centuries of experience as physicians, and among them they have 85 children and 18 grandchildren. The Mommy MD Guide to Getting Your Baby to Sleep offers advice on all aspects of baby, toddler, and preschooler sleep. You’ll read how Mommy MD Guides faced the challenges of nap strikes, sleepless nights, illnesses, and crying. You’ll also learn how Mommy MD Guides celebrated success when their babies slept through the night, transitioned their toddlers from cribs to beds, and were able to enjoy date nights with their husbands. These Mommy MD Guides generously shared the wisdom and tips that they learned in their own lives to sleep better and live well. Order the ebook here, the paperback here, and the audiobook here!